I arrived at the New Parish 3/4ths of the way through The Seshen’s set, just in time to catch their last two songs. Bummer, because they sounded great and they got the crowd open. Those last two numbers were pretty tight, though, running from downtempo emo to uptempo rave-up. If you haven’t heard them before, The Seshen blend soulful, emotional vibes with heavy grooves which land somewhere between R&B and electronica. Fronted by Lalin St. Juste and Akasha Orr, they mix ethereal vocals and live instrumentation with a lot of electronic effects; their sound is more than a little reminiscent of ‘90s trip-hop, achieving the poignancy of a Morcheeba in a way that seems more cyclic than derivative. They do original songs which aim for – and hit – a resonant chord deep in the cerebellum, pushing the sonic envelope forward at all times. 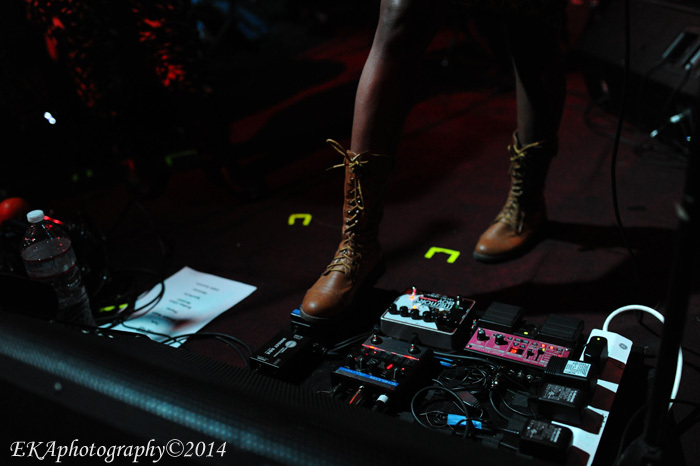 Glancing at their set list, which lay next to a small village of effect pedals used by St. Juste to enhance the moodiness of her vocals, I noticed their last song was called “2000 Seasons” – inspired by the Ayi Kwei Armah novel of the same name. “This is what you want/ the tick-tock of the clock rolls on,” the song’s hook proclaims. But while The Seshen might sound fresh and different to today’s audiences, they wouldn’t have sounded out of place on one of the classic “Rebirth of the Cool” compilations of two decades ago, which established an Afrofuturist, post-hip-hop blueprint that freely blended retro soul and jazz influences with forward-thinking (at the time) musical ideas. Watching The Seshen live, it seemed entirely appropriate to revisit a place which created so many memorable experiences back in the day. This is a band which could have come out of London or Johannesburg, yet the fact that they are from the Bay speaks to the range and diversity of our local music scene. Chances are, they won’t be an opening act forever. The Seshen were perhaps the perfect opener for Shabazz Palaces, a progressive hip-hop duo who sound almost nothing like contemporary rap these days. They favor abstract, atmospheric EDM beats over bassed-out trap tracks. They don’t really have hooks or choruses, a few repeated phrases notwithstanding. And they’re less interested in spitting out formulaic 16-bar radio-ready verses then taking listeners into a journey into a swirling, moody post-hip-hop aural landscape. If rap is primarily ego music, Shabazz Palaces come from the id, offering up tracks which are more subliminal than liminal, whose sum is greater than the total of its individual parts. They’ve got a pedigree—lead vocalist Ishmael Butler was a founder and the driving musical force behind Digable Planets, the much-loved ‘90s rap trio forever identified with the hip-hop jazz movement. But while the DPs were stereotyped and pigeonholed for their Grammy-winning single “Rebirth of Slick (Cool Like Dat),” it’s impossible to place Shabazz Palaces in an easily-definable box. If there’s a concept behind SP’s sound, it’s the blending of technology and tradition. Much of the first aspect is supplied by Butler, who spent much of the night alternating between rapping and button-pushing on a beat machine/sampler. 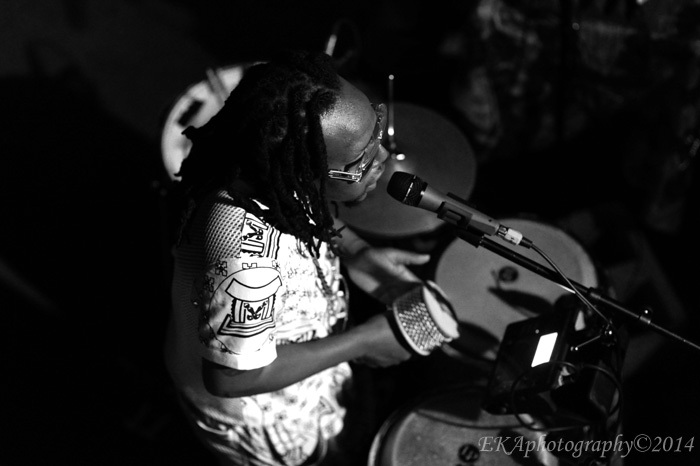 The second aspect is largely the domain of Tendai “Baba” Marair, a multifaceted percussionist of Zimbabwean ancestry who played mbira, congas, and a snare kit and supplied backing vocals. 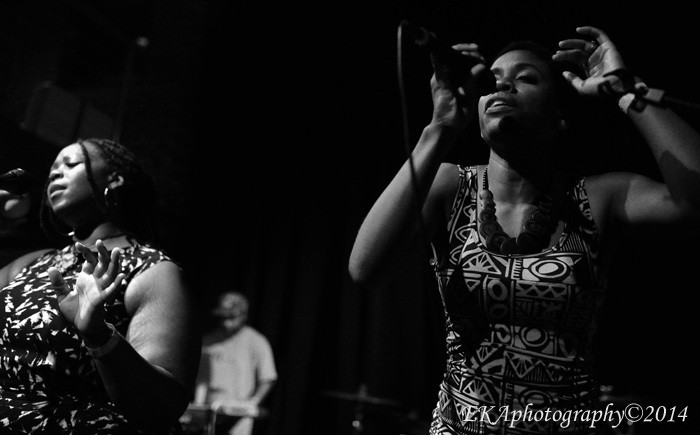 This was SP’s second time performing live at the New Parish, and featured less extended improvisations and more attempts at framing their expansive yet minimalist sound into structured songs – possibly due to the impending release of their sophomore effort, Lese Majesty. SP’s first album, Black Up, was an hour’s worth of WTF? moments, as their minimalistic take on world music and not-quite boom bap resonated with ears tired of predictable, monotonous sounds. Lese Majesty, sounds different, yet kinda the same, in that it only barely resembles today’s trapped-out radio rap. It’s a further excursion down Afrofuturist lane; live, it seemed like Butler and Marair were most interested in indulging their creative impulses. There wasn’t much audience interaction, and their stage presence leaves something to be desired. But it was still cool like dat. 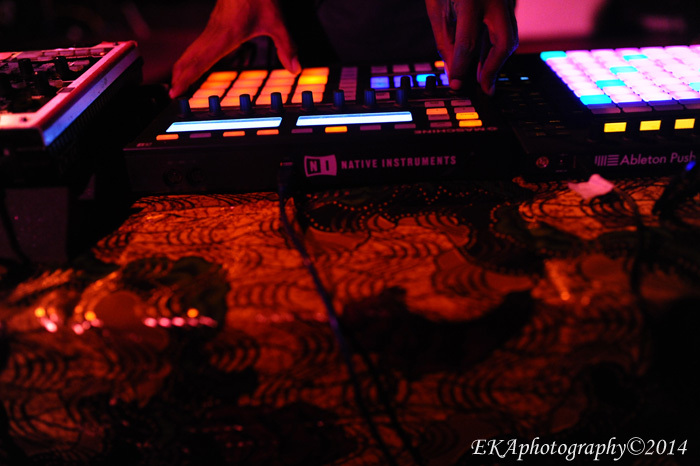 Categories: Live review | Tags: 2000 Seasons, afrofuturist, Lese Majesty, New Parish, Oakland, Shabazz Palaces, The Seshen | Permalink.